A new record by Anders Bryngelsson (Brainbombs) and Mattin's exploratory project Regler, and where else could they release "Metal" but through At War with False Noise?! 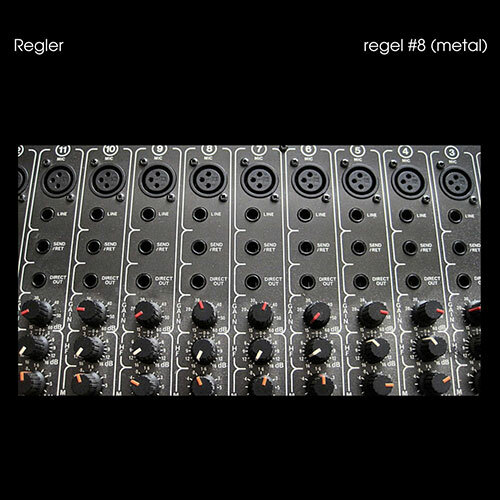 Regler is all about musical reductionism: taking the bare elements of what constitutes a genre and decompartmentalising in what initially seems to be a pretty esoteric whole. This chapter sees the guys taking on metal. Masami Akita has said he loved rock music but his favourite bit was at the end of performances where there was loads of feedback and noise and stuff getting wrecked, and that's what drove him to make "noise". This is a kinda vague variation on that. "Heavy Metal" starts off with thundering drums that could be the intro to any stadium metal tune, but they keep going. And going. Over this is a wail of feedback and grandiose riffing, total heavy metal thunder. It changes pace, starts to chug along. It's heavy metal, but not as we know it. "Thrash Metal" is an altogether more abstract affair, but the snippets we hear probably bear more resemblance to the genre than the previous tune. It sounds like a thrash band are powering away in a sound-proof rehearsal space and somebody's standing at the door, opening it for a couple of seconds at a time to record whatever madness is going on inside. For a form of music that's characterised by jagged, sharp guitar work, this succeeds in at least the respect that the short, sharp blasts of noise could cut glass. Things soon get going and the affair becomes an avant free-for-all, percussion being abused and Flying V strings being torn asunder. Top notch. The band's take on "Black Metal" is a bizarre one (course it is), sounding a bit like Marduk playing while falling down a flight of incredibly high stairs. It bears little resemblance to the genre, though the drums are fast with plenty of hi-hat. There might be vocals in there, but they might be from a black metal recording being mixed in with the psychedelic free-form aural battery being created by the duo. It's got quite an industrial sound, with the drums absolutely unrelenting and metallic clanging, scraping and a hazy fog of dissonant horrible noise pervading every moment of its 30 minute plus run time. It's far from easy listening, but then black metal seldom is. Digipak. Limited edition of 300 copies.